My presentation on Caring for your Family Records at the Second National Australian Jewish Genealogy Conference in Melbourne last weekend was very well received. I had intended to spend the whole day at the conference but we experienced some minor roof damage from the previous nights’ storm and minor flooding in the lounge room which delayed us a bit. We arrived just in time for the two talks before lunch, and my talk was one of three concurrent sessions after lunch. The session was held in the Auditorium as almost 100 people elected to listen to my presentation which was very pleasing but I did feel sorry for the other speakers. That is always a problem with concurrent sessions – you usually want to go to more than one of them. Due to the size of the audience, it was not possible to take questions during the presentation although a few slipped in and audience interest meant a number of questions at the end. We were followed by a plenary session so further questions had to be put on hold until afternoon tea. During the changeover of speakers, however, many people took advantage of the time to take copies of the handouts and complete the evaluation form that I ask people to do at all my talks. I love feedback, both positive and negative, as it allows me to deliver the talks that people want. She could have talked for hours! The only negative comments were around the fact that the hour session was not long enough and there was not enough opportunity for everyone to get their questions answered. I did speak to more people during afternoon tea. The other big plus for the day was that I was able to promote and sell copies of my new book Your Family History Archives: A Brief Introduction which is an expanded version of the presentation. A small A5 40 page paperback, it is the basics of recording, organising and caring for family archives and what to do to ensure your collection is not lost to future generations of family and other researchers. A family archive does not eventuate overnight, it slowly (sometimes quickly) grows over the years. 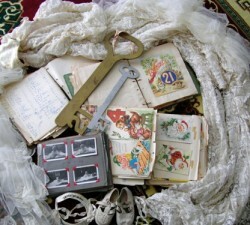 The first section of the book encompasses collection, organising and accessing your family records and memorabilia. The second section is the conservation and preservation process to ensure that the records are kept for future generations. The final section is what happens to the collection in the future. Writing the book was a good reason to look closely at my own practices and while some of my records are kept in good archival order, there are parts that I have not had time to do or I am not that keen on doing eg scanning all my certificates and other paper documents. I now have a long list of things that I want to work on. I have been visiting my mother in Brisbane a lot lately and have become aware that she has been ‘hiding’ some family heirlooms at the back of cupboards. The photograph on the front cover of the book represents some of what I have ‘found’ – her wedding dress; Dad’s and Mum’s 21st birthday keys and the birthday cards lovingly put into an album now falling apart; a dilapidated folder of recipes and draft notes on a range of things including the guests invited to their wedding; a spine damaged photo album of my baby photos and my first ever pair of shoes! Your Family History Archives: A Brief Introduction is available for sale online for $10 plus p&h from Gould Genealogy and History and I will have copies of it for sale at all talks and events that I attend in future. In 2013 this blog was selected for permanent preservation in the National Library of Australia's web archive.